My heart sank when I saw the news yesterday. It seemed so surreal. The effect of the images that accompanied the story felt like they cut me off at the knees. The consequences of this attack are profoundly sad on so many levels .. that they seem impossible to fathom. This is why there is mind-blowing aspect to such things. Denise Evans wrote a wonderful piece on » Manchester's Resilience. And Natalie Shutler wrote another titled » What an Attack at an Ariana Grande Show Means for Teen Girls. 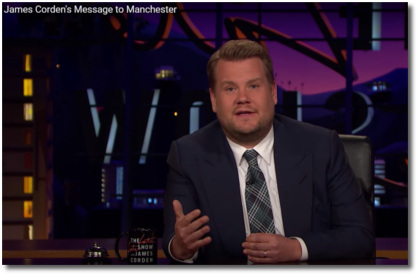 James Corden said about Manchester that "A more tight-knit group of people you would be hard-pressed to find. Strong, proud, caring people." Who does not want to grow up in, and call home, a place like that? As graffiti on a disused rail depot not far from Piccadilly train station has it, Manchester sees itself as "a haven for heathens, hoodies and hipsters, hijabis and Hebrews, highbrow intellectuals and however-you-sexuals ... it's home to all." That sounds like my kind of town .. where they live and let live .. absent the mental illnesses typically associated with repression. 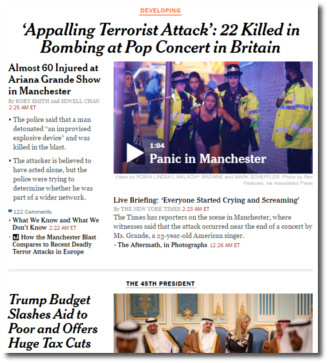 Continue reading Such a Drastic Contrast in Manchester.